60 SMT Magazine • November 2017 capacitance and inductance, for improved high- speed performance. Figure 1 illustrates how the VIPPO structure can influence those parasit- ic effects. The signal traces, which connect the BGA pads with the vias, act as inductors. 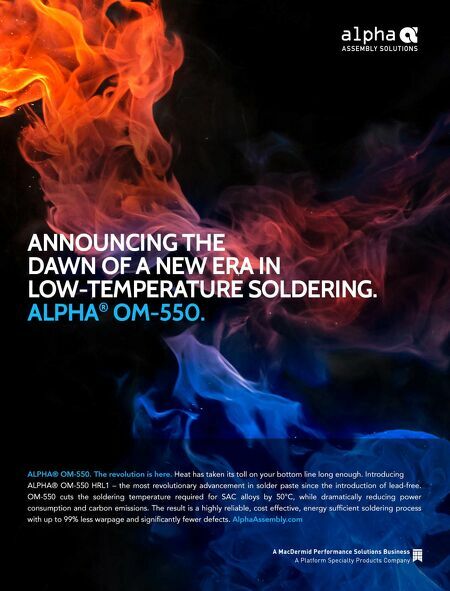 Ad- ditionally, as high-speed designs typically have ground planes immediately below the outer lay- er, there is also a capacitive effect that is gener- ated. With the VIPPO structure, the outer trace layer is eliminated, thereby cancelling both par- asitic effects. Figure 2 exhibits the VIPPO structure as com- pared with the VIPPO + backdrill (BD) structure. The use of backdrill with the VIPPO structure by S.Y. 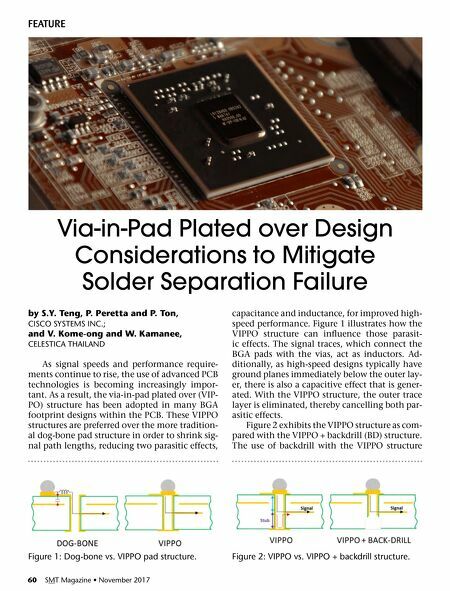 Teng, P. Peretta and P. Ton, CISCO SYSTEMS INC.; and V. Kome-ong and W. Kamanee, CELESTICA THAILAND As signal speeds and performance require- ments continue to rise, the use of advanced PCB technologies is becoming increasingly impor- tant. As a result, the via-in-pad plated over (VIP- PO) structure has been adopted in many BGA footprint designs within the PCB. These VIPPO structures are preferred over the more tradition- al dog-bone pad structure in order to shrink sig- nal path lengths, reducing two parasitic effects, Via-in-Pad Plated over Design Considerations to Mitigate Solder Separation Failure FEATURE Figure 1: Dog-bone vs. VIPPO pad structure. Figure 2: VIPPO vs. VIPPO + backdrill structure. Column — Two Prevalent Rework Heating Methods—Which One is Best?